This volume is a turning point for the Dengeki Daisy series. A lot happens that sets up the plot for future books, but I never had the feeling that it was simply a place holder. Kurosaki can't take the secrecy anymore. He wants to tell Teru not only that he's Daisy but that he loves her (he doesn't say this outright, but that was my impression). He is becoming increasingly protective of Teru and doesn't have as many rude janitor/master moments with her. I missed some of this, but their relationship is growing into a sarcastic bantering one rather than an over the top faux worship and hatred one. In anticipation of the big reveal, Kurosaki invites Teru out on their "first date." Teru gets to pick where they go. I loved all the choices she contemplated - including painting kokeshi dolls - weird ideas for a first date. She settles on an amusement park. It's hilarious seeing Kurosaki make his way through an amusement park. It doesn't feel like his place. But alas, evil Akira comes to tear apart the happy couple just before things start getting really good. The volume ends with a huge, heart breaking cliffhanger. I'm sure things will work out in the end, but my heart ached for both Teru and Kurosaki. On the bright side, there is an incredibly passionate moment between Teru and Kurosaki midway through the volume. I love how drawings of characters just looking at each other can feel much more intimate and passionate than kissing. A big squeal moment. 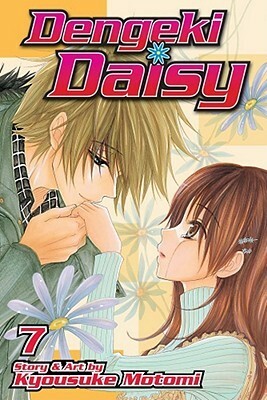 Another good Dengeki Daisy volume! I just started reading this series a few days ago, great review. I'd never seen this one before, but as soon as I spotted the cover, I immediately went off in search of an anime. I have a bad habit of assuming that every manga has anime counterpart, and so, alas, I was so disappointed to see that there wasn't one. While I'm not a manga fan myself, I have a bunch of students who adore it and I'm working with my media specialist to get some manga in the library. I told her to read your reviews--you know your stuff! Ah! I want to read this so bad. Thanks again for the great manga review! Glad to hear you enjoyed this volume!